You or your child may experience an upset tummy for a variety of reasons – difficult emotions or situations, or too much cheese pizza! This popular oil blend is something to have on hand for a quick soothing sensation. DigestZen contains Ginger, Peppermint, Caraway Seed, Coriander Seed, Anise Seed, Tarragon Plant, and Fennel Seed essential oils. Feeling nervous or woozy before or during travel? Add a few drops to water to take internally (for grown ups only) or rub on the tummy before flying or taking a road trip to soothe and settle. 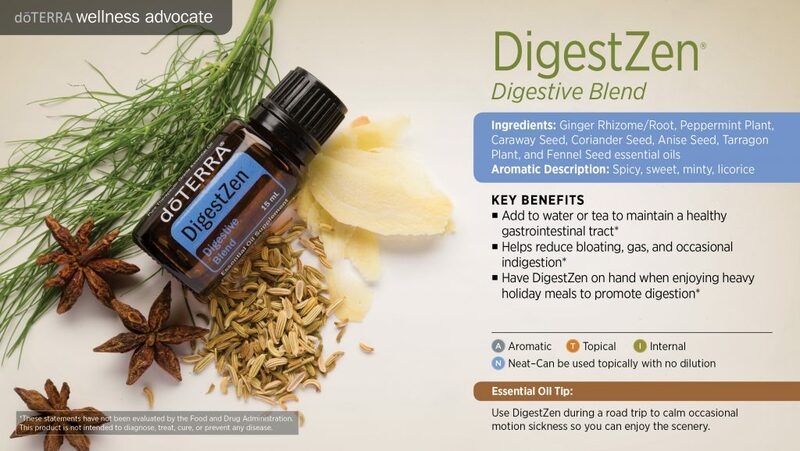 One of the most relaxing ways to use DigestZen oil is by applying it to the stomach and massaging. An abdominal massage will bring soothing comfort to your stomach and the aroma will provide you with calming feelings. DigestZen can also be applied to a child’s stomach for soothing comfort. Before using DigestZen for a massage, combine it with fractionated coconut oil to help increase the DigestZen oil distribution and minimize any skin sensitivity. Contact me to purchase this oil for yourself. And visit my doTERRA website for more information.